It’s in the middle of the Baltic Sea, halfway to Latvia, but it’s Sweden’s largest island. It’s been occupied since at least the Middle Neolithic, and you’ll find rune stones, ship burials and the remains of fortified settlements. You might even find buried treasure, like the legendary Spillings Hoard, a massive 87-kilogram pile of Viking silver and bronze dug up in 1999. The island’s walled capital was the main centre of the Hanseatic League (13th to 16th centuries), a mercantile and military alliance of northern German and Baltic cities. And today it is the best preserved commercial medieval city in northern Europe. If you go there by ship, like Tomoko and I did—a rolling three-hour journey from the port of Nynashamn, south of Stockholm—you will discover that this strange island is home to several distinctive warps in time. You’ll notice it first in the island’s capital. 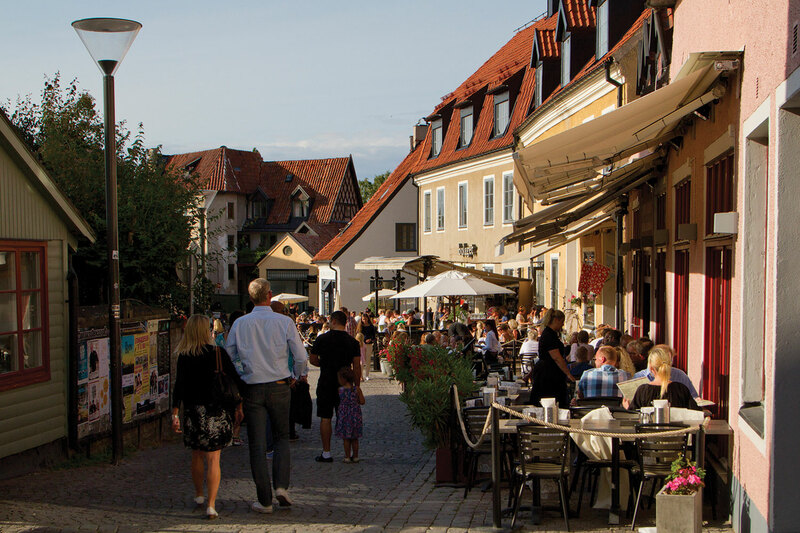 Walking in Visby is like a journey through Medieval Times, without the tacky dinner show. We wandered for hours along cobblestone streets, past tall merchants’ houses whose facades and market squares radiated sober, careful wealth. These leading citizens transformed Gotland into a vital trading hub, and the orderly layout of their town reflected sober businessmen living strict pious lives. We paused sometimes to crunch across gravel and grass in Visby’s many ruined 13th-century churches, where the graceful arching shells of walls reach towards a modern indifferent sky. And we stopped at a cafe for the famous saffron pancakes, smothered in red berries and cream. We wandered for hours along cobblestone streets, past tall merchants’ houses whose facades and market squares radiated sober, careful wealth. But the city doesn’t reveal everything. The countryside of Gotland tells a very different story, and that Hanseatic merchant atmosphere didn’t extend far beyond Visby’s tall grey defensive walls. The Vikings ruled the island’s forests and fields. Their heyday was the fifth to 11th centuries. But don’t expect looting or horned helmets—the first is an exaggeration, and the second was just made up. The Viking world you’ll find on Gotland was comprised of hard working farms. The Vikings believed that the island was enchanted, and that it vanished during the daytime and reappeared at sunset. At first I thought this was just superstition, until we ventured down a small forest road in search of stones. We found a scarred mound, the remains of a Bronze Age fortified hilltop. And beyond it, a Viking ship burial whose blunt standing stones were crusted with lichen. 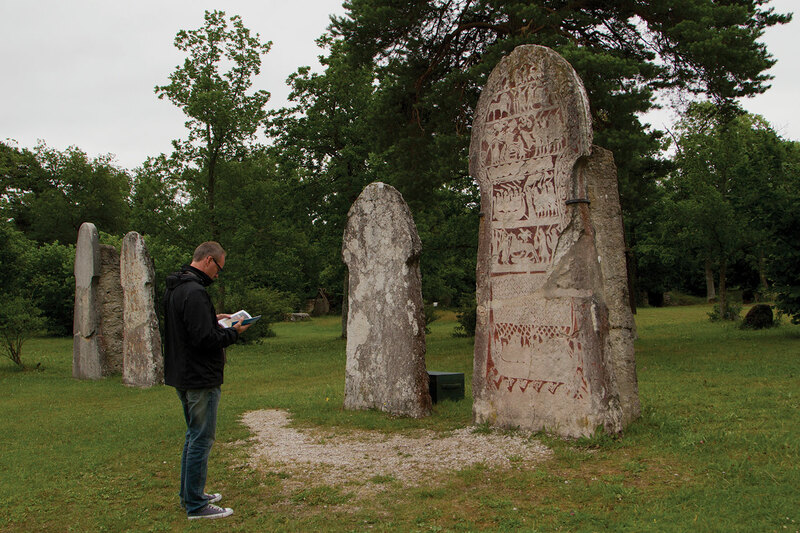 You’ll find rune stones on Gotland too, carved and painted with mysterious swirling symbols. And you will feel that magic exists—or at least, that it used to. Today the rolling countryside is a peaceful place of red-painted wooden houses, rustic farms, and pine forests that swallow all sound. And along the coast, fishing villages with simple wooden huts that sometimes sell part of their catch to visitors and locals. We stopped for lunch at a small cafe in coastal Lergrave, in the north. The wooden walled hut sat at the bottom of a steep hillside where rocky sea stacks rise like bones from the grassy slope. “All of our fish are smoked in the little hut right outside,” the owner said, and so we made our choices from the display case and sat down. The salmon was juicy enough to be baked, but it had a slightly sweet woodsmoke flavour. We ate it with our fingers, and washed it down with local beer from Barlingbo Bryggeri—a well-rounded Muren Gute Ale for me, and a Galgbacken IPA for Tomoko, with a floral nose and a sharp bite of hops in the mouth. A nautical chart of Åland was tacked up on the wall behind us. It was dotted with channels and depths, and with the islands we had so recently passed through. But we had a nearer landfall in view. Standing on the edge, looking out at the sea. 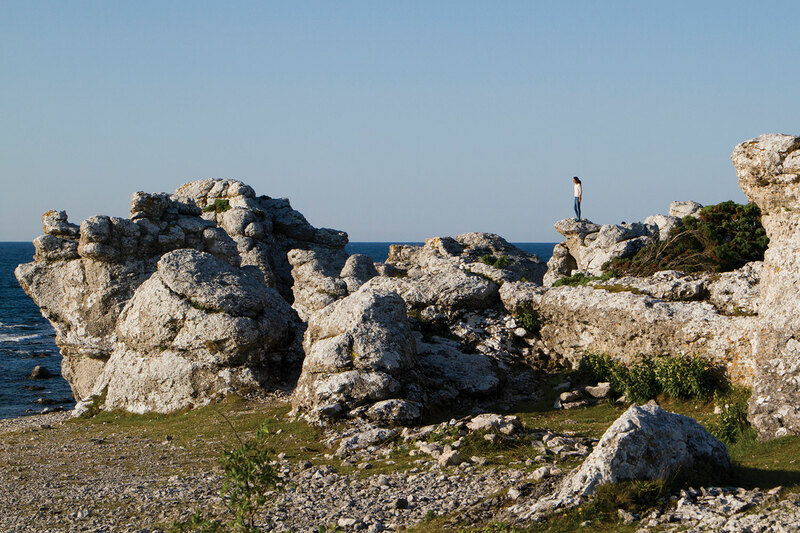 I had come here to see a small rocky island that sits off Gotland’s north coast because I wanted to step into a landscape that had already cast magical spells in the theatre of my mind. Swedish filmmaker Ingmar Bergman first came to the tiny island of Fårö in 1960, on a stormy April day, searching for a location to shoot Through a Glass Darkly. Bergman was already a household name, with 28 films to his credit and an Academy Award. But they didn’t really know him on this isolated island. Even years later, when the true weight of the director’s fame became known to them, the islanders treated him as a local. When tourists would stop to ask where Bergman lived, the islanders always pointed them in the wrong direction. Though Bergman only shot five films and a documentary on the island, its landscape and name have become inextricably linked with his. He would live there during the summer for 40 years, and that was where he spent the last few years of his life. 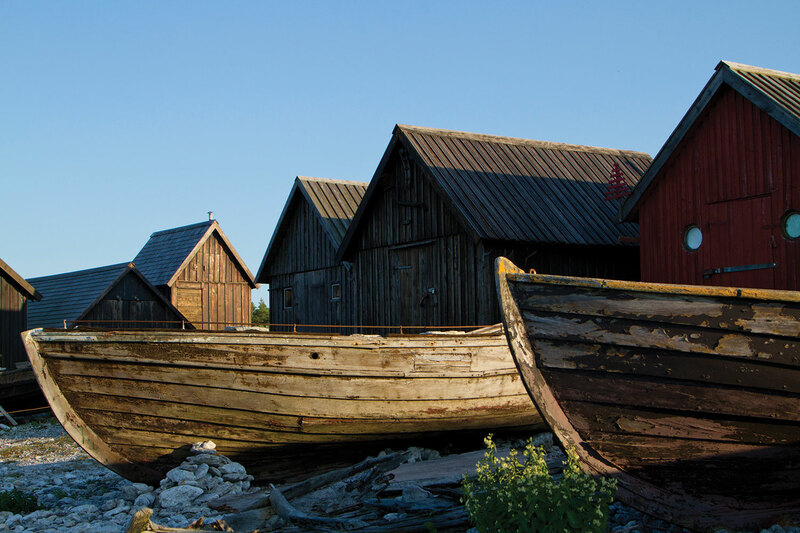 Fårö is a sparsely populated, stony island of farmhouses and fishermen’s shacks. A poor place in the best of years, where rugged people scraped out a forgotten existence in the grey Baltic Sea. A place of harsh howling winters, and magical summers spent under skies aglow with soft Nordic light. The old fishing settlement of Helgumannen. I sensed a change in the atmosphere the moment we drove onto the rolling car ferry to cross the Fårösund. 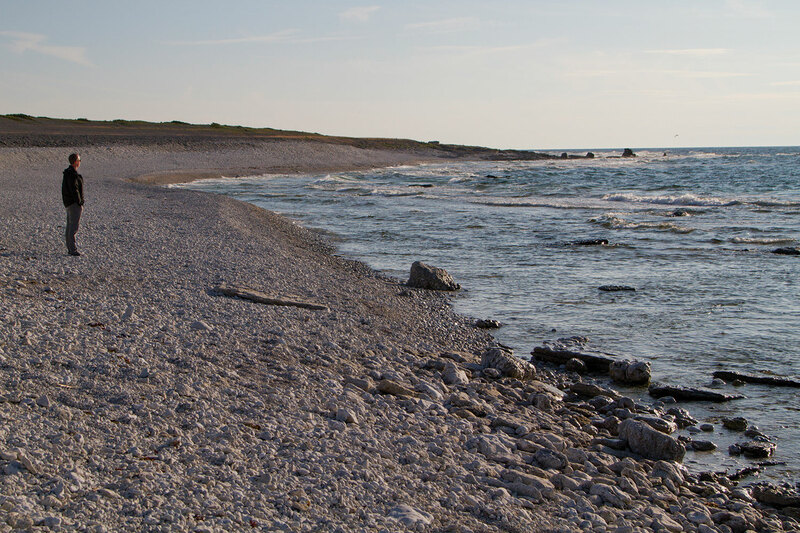 It was only a five-minute passage, but it felt as though Gotland was shot in colour—forest greens and Baltic blues—and the landscape and feeling of Fårö was black and white. After a stop at the Bergman Centre (inaugurated in 2013) to look at old photos, we crossed the entire island to Skärsände, searching for the shipwreck from Through a Glass Darkly. We found the setting on a stony shingle beach, but the trawler Mogens had been removed long ago. And so we cut across the island to the west, toward the tall limestone sea stacks of Langhammars and the old fishing settlement of Helgumannen, significant locations from the films The Shame and A Passion of Anna. We shunned the main road, and as much as possible followed tracks that edged near the coast. The road we were following eventually became a rutted gravel track filled with large pools of rainwater. I drove around them when I could, and we plowed through the others at a steady pace, with the top of the bumper pushing out a bow wave that threatened to spill over the radiator grill and shut us down. On impulse I followed a left fork which seemed to be trending in the general direction I wanted to go, but the dirt road narrowed to two tire ruts, until even they had faded away, and we were bumping across an open field in a rented 1994 Audi 100. I switched off the engine and rolled to a stop beside a pond. We heard the bleat of sheep in the distance. The ticking of metal as the engine cooled. The faint voice of cyclists pedalling along a distant road. And then the sky shifted and cast a glow that altered the mood to a Bergman scene. We had slipped inside the visual of his world. Bergman’s films are not melancholy or depressing, as they’re often painted to be. They’re also filled with raucous humour, incisive wit and genuine joy. And more than anything, they are charged with unsparing truths. In sifting through our collective unconscious on celluloid, Bergman demonstrated that film could be something more than just entertainment, that it could be art. But the questions he tackled in his most important films are just as relevant to us today. I stood there looking out to sea, reflecting on my life. They’re introspective, probing into existential problems of our mortality, and our loneliness as a species, self-knowledge, and the problems of relationship. He was also the first to lay emotion bare through long uncompromising close shots of the cracked and changing canvas of the human face, much as the bones of Fårö are laid bare under that cold northern light, and flayed to elemental forms by the winter winds. It’s no wonder Bergman felt so at home here. As the summer light finally began to fade from the sky, we drove down narrow tree-canopied lanes toward Hammars, and followed a rutted dirt track which ended, as so many do, by the sea. And we walked along the shore until we found the small “cliff” with its jumble of rocks, the place where Bergman set a key scene in Persona. Persona—a difficult film, widely regarded as the director’s masterpiece—deals with shifting, self-contradictory identity and the permeability of boundaries between self and the other. Can we ever truly know another person, and can we know ourselves? I stood there looking out to sea, reflecting on my life, and my journeys, and how I framed them into narratives of meaning in my mind. And then I looked down the shoreline, and down a long curving shingle beach. I saw someone walking towards me in the distance, just as Bergman used to do every day, with his head bent deep in thought. The figure approached, but not close enough for me to see whether it was a man or woman, young or old. I never got a close enough look. Just as this mysterious person was about to come into focus, it turned around and walked back down the beach, in the direction where I later learned Bergman’s house had been. Was it an apparition, or just another trick of that magical Fårö light? Like so many others, that secret belongs to the island.